Update: Triggertrap is no longer in business; support for this product has ended. However, you may still be able to purchase a used Triggertrap Mobile Dongle via eBay . The Triggertrap Mobile Dongle is a camera triggering accessory that, when paired with your smartphone, allows you to trigger your camera in fun, exciting and unique ways. The device is very small and relatively inexpensive, making it a practical investment that will find a permanent home in your camera bag. When Triggertrap offered to send me their Mobile Dongle for review, I gladly accepted (it was an item I had been considering for purchase for quite some time). 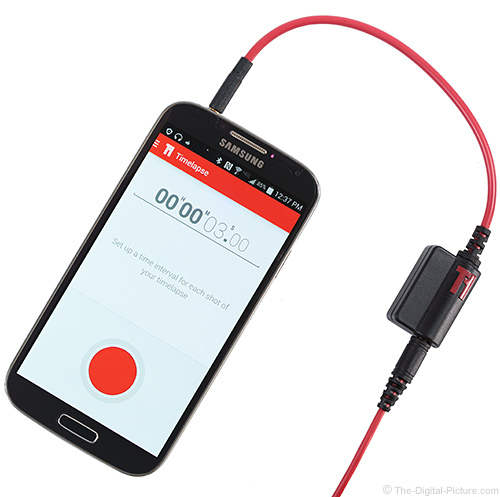 The Triggertrap Mobile Dongle consists of a dongle that connects to your smartphone and a cable that connects the dongle to your camera. 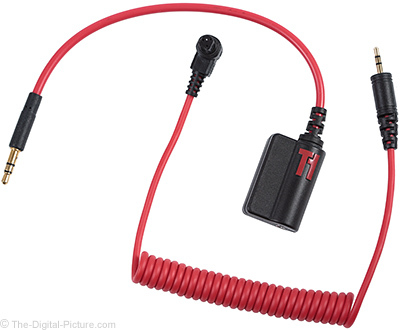 As the cable that connects to your camera is interchangeable, the Triggertrap dongle can be used with a wide range of cameras (assuming you purchase the corresponding cables). An important thing to note is that your phone's volume needs to be set to its maximum level in order for the Triggertrap Mobile Dongle to trigger your camera. The Cable Release Modes, while very useful, are not terribly exciting as a traditional corded shutter remote switch gives you much of the same functionality (except for the self-timer – which is a feature that your DSLR already has). However, the other triggering modes make Triggertrap's value much more obvious. I'll be focusing on a few of those features throughout the review. Before we dig deeper into the Timelapse Modes, now would be a good time to mention a few things about the Triggertrap app. First, keep in mind that my experience with the Triggertrap app is limited to the Android version loaded onto a Samsung Galaxy S4. If you have an iOS device, the app may not have the same exact interface. But personally, I found the Triggertrap app for Android to be quite frustrating to use because of two key user interface issues. My first issue with the application is how it fails to utilize the standard Android back button. For instance, once I choose a triggering method, the triggering method menu disappears and the variables for that triggering method are displayed along with a big red button. In my opinion, pressing the back button should revert to the previous state of the program where I can choose a different triggering method. Instead, pressing the back button simply exits the program (it has the very same effect as pressing the Home button). For someone who's accustomed to using the back button to navigate through different stages of their Android applications, this app's behavior can be maddening for the user. My second issue with the application is how it handles text input for changing numeric variables. For instance, you cannot select a specific number for modification. Instead, if you want to change an interval from 5 seconds to 6 seconds, you must first press your finger on the value you want to change which brings up the number input box, press the backspace button three times (as Triggertrap intervals can be set in hundredths of a second) then type in "6-0-0". That means the Triggertrap Mobile app requires six button presses to change your interval by 1 second, which seems a bit inconvenient to me. The text input is not a deal breaker by any means, but it is a small annoyance. 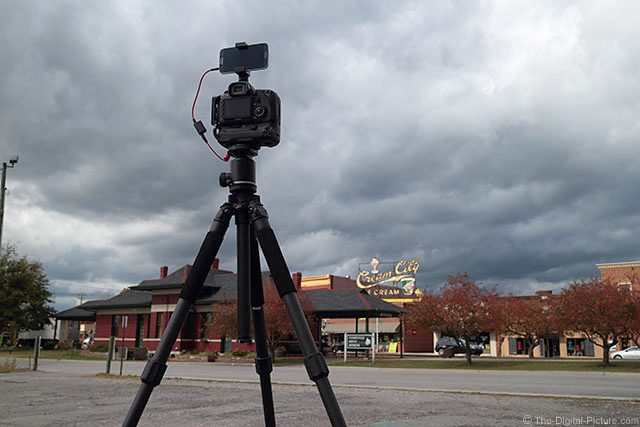 When it comes to the Timelapse modes, the simplest is of course the standard time lapse. While the feature is extremely useful, there's nothing particularly special about this implementation as it triggers your camera just as any intervalometer would. The TimeWarp mode was one of the features that really drew me to the device. In TimeWarp mode, the Triggertrap dongle varies the time in between shots based upon your preferences. I decided to try and simulate the opening sequence of a film using the Triggertrap's TimeWarp feature. When rolling clouds blanketed my hometown, I decided to feature a local historic landmark in my fictional movie introduction. You can see the setup below (taken with an EOS M). On my first attempt at capturing the TimeWarp time lapse, I did experience an issue that caused Triggertrap to stop triggering the camera. The issue presented itself when I received an unexpected phone call. I had a bluetooth headset connected to my phone at the time so I could hear any notifications from the phone while the time lapse was underway. However, when I received the incoming call, I tried to answer the call using my Bluetooth headset. And indeed, the call was connected after I pressed the "Answer" button on my headset. Unfortunately, as the phone had a cable plugged into the 3.5mm headphone port, audio was being routed through the headphone port instead of my wireless headset. It was a few minutes before I could work out just what was going on. In the meantime I missed two successive calls from the caller. The worst part is that every time a call came through to my phone (answered or unanswered), Triggertrap would stop triggering the camera until the call stopped. I finally decided to cancel my first attempt and return the caller's phone call. After that I tried capturing a TimeWarp time lapse for a second time and came away with the images I had intended on getting in the first place. The end result is a little cheesy and the randomness of the clouds makes the effect less obvious, but I think you can see the potential this effect has to add value to your video productions. I contacted Triggertrap to ask them if the interval shooting pause I experienced while receiving a phone call was normal. They assured me it normal and advised me to set the phone to Airplane mode while using Triggertrap. That is a simple and effective solution for sure, but it does reduce the functionality of your communications device when Triggertrap is in use. Another unique and valuable aspect of the Triggertrap Mobile Dongle is the ability to trigger your camera based on distance traveled. The DistanceLapse feature will be especially welcomed by those who enjoy road trips. Unfortunately, I didn't have a good opportunity to use Triggertrap on my most recent trips (the cars were packed too full to include a tripod-mounted camera), but I did try the feature out by driving to the next interstate exit west of my hometown and then back via an alternate route. The camera was mounted on a tripod in the passenger's seat and Triggertrap performed exactly as expected. You can see my sample DistanceLapse below. Considering all the triggering modes that the Triggertrap Mobile Dongle is capable of, I have only begun to scratch the surface. I had intended on capturing a star trails and bulb ramping example to accompany this review. Unfortunately, optimal weather conditions and my own availability seem to have been mutually exclusive over the past few months. If I should complete these in the not-so-distant future, I will update this review to include the samples and workflow used to create the images. With smartphones already a prevalent part of our daily lives, it makes sense to utilize these micro-computers as smart triggering devices for your camera. The Triggertrap Mobile Dongle and specially designed app allow you to easily create time lapses and images that would be very difficult (or more costly) to create otherwise. The Triggertrap app may leave a little to be desired (Bryan really likes it), but the Triggertrap Mobile Dongle has been in my kit for the better part of a year and it will continue to go with me whenever my camera bag leaves the house. It's a cost-effective, easy to pack, valuable and versatile tool that has earned a place in my permanent kit.